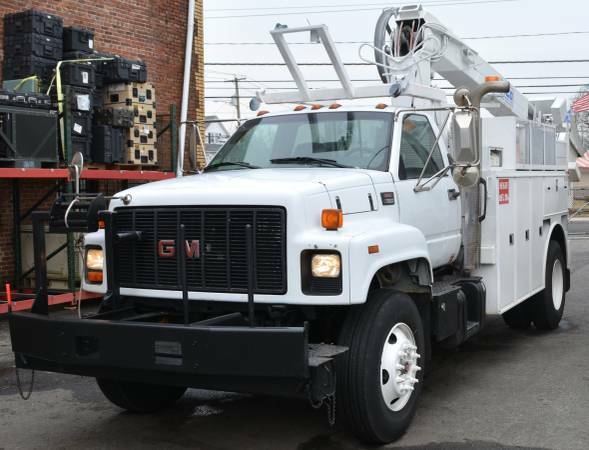 2000 C7500 cable placer truck. Starts runs and drives strong. Truck running in pics, and had been running for several hours. Air brakes. Cat 3126 engine 230hp. WTEC3 trans control. Tires have plenty of tread left. Small power steering leak, see pic. Dash temp gage does not work. Will need new batts but drives fine with a jump start. Some rust under doors. Looks like it was painted a few years ago and there were some surface rust spots here and there that got painted over. The hydraulics are run off a 12v electric/hyd pump. And the system is not getting power. So the bucket and spools dont work. I dont know much about the system and other than taking a few power measurements with a meter I didnt get into it. The cab strobe and spool controls in the cab dont have power either. Regular truck functions like lights and horn work fine. Clear RI title, has been reassigned a few times. I can have the transfer paperwork done thru a friends dealers license if this is an issue. CT dmv does not care. Some states do. CL EMAIL BEST CONTACT.